Deposit of £100 is required to secure your booking and Outstanding amount to be paid in full 6 weeks prior to holiday start date, if less than six weeks then full amount will be required. Passes to Haven entertainment and facilities not included in the price we do take into consideration that you have to buy passes separate that's why our prices are considerably cheaper than Haven . Checking in time is 3pm And checking out time is 10am. A Security Bond of £50 will be added to your holiday price this is required to secure your booking also to cover against any damage or loss caused, and will be refunded providing there is no damage or loss at the end of your stay after the caravan has been checked within 3 working days . If You decide to cancel then your £50 Security Bond will be refunded, but you will lose your £100 deposit if you have paid in full and has given me at least 4 weeks notice then any amount over the £!00 will be refunded. Nothing but toilet tissue to be put down the toilets. There are other carparks near by that you can park a second car. L-shaped seating area with pull out bed. We provide Pillows and duvets you will need to bring your own sheets, pillow cases and duvet covers unless you have booked 7 nights or more. If less than 7 nights are booked you will need too bring your own linen (fitted sheets, pillow cases and duvet covers for each bed ) If you would like linen provided and the beds made up there will be a small charge of £15 for this, unless you book a full week there will be no extra charge. and all beds will be made up for your convenience. Just outside the park you can catch the local bus into Weymouth town, other places you can visit include Monkey world, Tank Museum, Corfe Castle, Sea life centre, Dinosaur Museum, Water Gardens and local markets. *Please note that if you want to use the Haven facilities, passes will be required which you can purchase at reception. This was one of the most comfortable caravan holidays we have ever had and due to many tragic things that have happened over the last 18 months my husband and would like to say we appreciate all the kindness shown to us for this holiday. Anyone would find it hard to find a better stay. Lovely caravan spotless clean and owners very kind ,even allowed us extra day without charge ,(haven would never be so kind! )thankyou very much John and Cheryl will be back again and have already recommended you to friends. Caravan in excellent position close to all amenities. Spotlessly clean looks brand new and very spacious. We traveled with an elderly person and it was ideal being close but not to close to the clubhouse. We would throughly recommend this accommodation and will definitely be looking to book again. Thanks John and Cheryl ???? 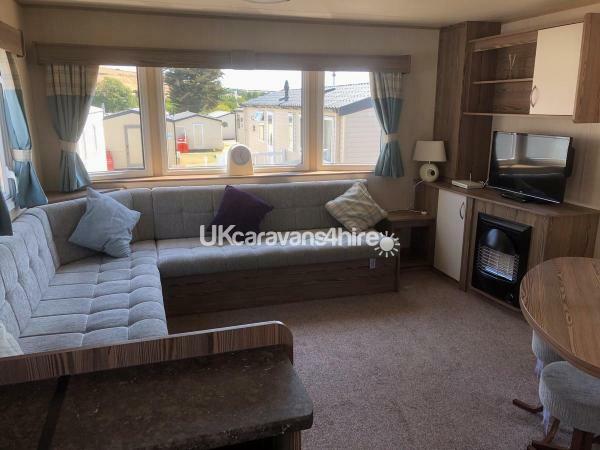 We was very very surprised to see how clean the caravan was and very equipped, It had also variety of channels to watch if you felt the need to stay home evening just relax. The caravan park was very entertaining and enjoyable stay very close to amenities to areas we would highly recommend this caravan and the caravan park and would certainly enjoy Returning. Well done caravan was one of the best caravans we stayed in. Lovely spacious caravan. 6 adults and a baby but never felt crowded. Owners kept in contact and updated us appropriately. My family, my wife and I and 4 kids aged from 12-18 stayed here for four nights. The caravan was new and very clean and had the essentials there for when you arrived like tea, coffee, sugar. The beds were ready made, leaving us nothing to do but unpack and enjoy the holiday ahead. The caravan is very close to all the amenities with the clubhouse, resteraunt, arcade and shop just a couple of minutes walk away. We couldn't have asked more from John&Cheryl, they have been very welcoming calling to see if we had got in the cravan okay and wishing us a great holiday. We plan on coming back again in the near future and can't recommend John, Cheryl and their lovely caravan highly enough. The caravan was fantastic!! It is in an ideal location to all the facilities on the Weymouth bay campsite. The caravan was modern, clean and in excellent condition! So many lovely extras! John and Cheryl have been excellent, very accommodating, helpful and relaxed! The campsite was lovely, great children’s entertainment, clean pool and fun for all the family! Thank you so much! We will be back next year!! Natalie and family! Have just spent the half term week with our 6&7 year old grandchildren and their parents in your caravan.we all had a fantastic time.the caravan is well presented and spotlessly clean with all the basics covered even down to liquid soap dispensers and tea towels.we found lots to do in the local area,not he fort,Portland castle,dinosaur museum and more. Hope to book again some time next year.thankyou John and Cheryl . Great spacious and clean caravan. Brilliant having 2 toilets with kids! Excellent site and facilities. Owner very prompt and very helpful to every query. Thank you!! Had a lovely time here the caravan is immaculate with everything that you might need included. The owners are professional and kept us informed at all times either by E Mail or text, made us feel very comfortable. The caravan is easy to find and is nicely placed on the site. It is nice to arrive to beds made up you only have to go in and start your holiday. Well done to John and Cheryl you have a nice place here and I hope that future visitors continue to treat it with the respect it deserves. See you next time. We had a lovely long weekend break at this fantastic location. The caravan is ideally situated, spotlessly clean and very comfortable. The booking process was straightforward with excellent customer service from the owners. The made up beds were also much appreciated. We will definitely consider rebooking this caravan next time we're in Weymouth. Thank you John & Cheryl. Really lovely caravan, excellent price & great location on the park. Lots for my boys to do on the park. Would definitely recommend & use again. We have just returned from a lovely holiday in John and Cheryl's caravan. 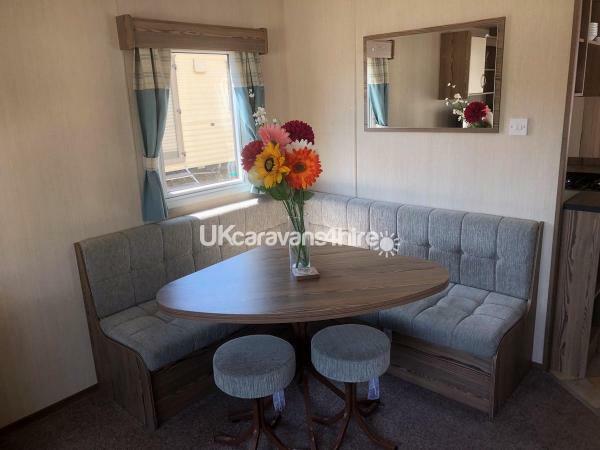 The caravan is very clean and comfortable and suited our needs perfectly. It's ideally located from all the main features in the park and I would happily recommend the caravan to my friends. Once again thank you John and Cheryl for accommodating us with all we needed for a great family holiday. A pleasure to stay in this caravan, everything is spotlessly clean, very comfortable and spacious. Having the beds made up was a bonus, saved loads of time on arrival and departure. Situated in a perfect spot on the park not too far from the entertainment complex but far enough not to hear any noise. We would definitely book again without hesitation. We stayed in John and cheryls caravan last minute.The service was excellent keys obtained easily and a super drive down to the site.The caravan is placed in a great position close to the entertainment centre ,park and pool.The site itself is lovely whilst it is quiet there is plenty to do.The pool is fantastic and as stated heated which is even better.Clean and tidy and lovely furnishings making the caravan homely.We will be staying again in the future. A lovely place to chilll if you are a couple or fun for the children if you have kids of any age. Thank you. Thank you Cheryl for your comments.